“It is the elite plant from Asia, the inspiration for countless myths, the manifestation of perfection, both flexible and strong in structure: Bamboo. Stories tell the tale of its nature. Gods display themselves through it. To be sure, bamboo serves as a symbol of luck and the image of long life…. We planted a grove of bamboo trees on the side of our home here in Coconut Grove. It’s the part of the garden that inspires meditation and relaxation — a place to read a good book and be still. Not surprisingly, our divine dog (11½ -year old black Lab, Bacchus) has decided that this part of the garden is his special place to lie down and catch a few zzzzz’s. What has amazed us is that only in the space of 1 week (I jest you not, ONE WEEK! ), this particular bamboo stalk has soared up to the sky, approximately 18 feet over the adjacent Royal Ponciana tree! We keep gawking at this bamboo stalk, in sheer amazement. Is this a sign that “the best is yet to come?” I’d like to think so. In the meantime, we shall keep raising our eyes in the same direction of our wonderful bamboo …. upwards, always upwards. (P.S. 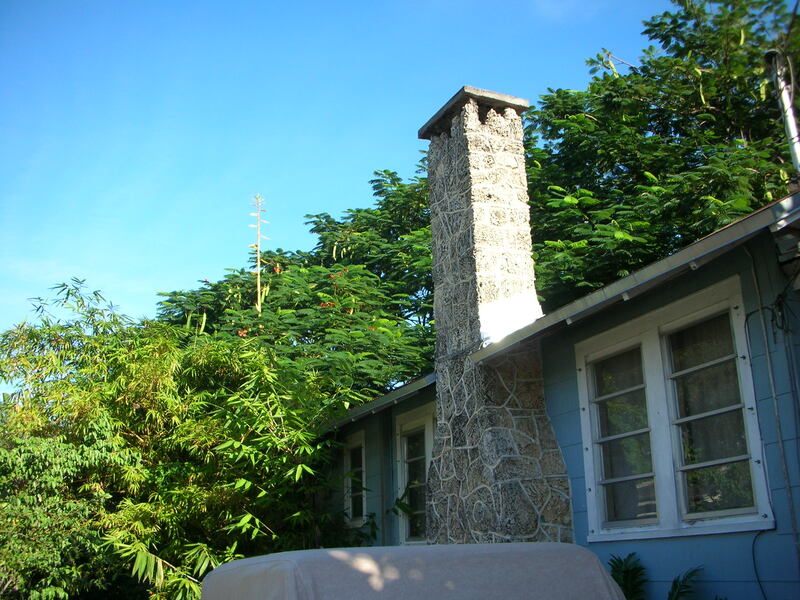 the fireplace chimney — original to this 1928 cottage — is pure coral. Coral is the native stone of South Florida. Whenever one tries to plant into the ground, one hits coral after about a foot of digging. Another one of nature’s blessings). This entry was posted in inspiration, other musings, spirituality and tagged bamboo, Heather Marinos, heatherfromthegrove, Taoism. Bookmark the permalink. The bamboo sprout is now 20 feet above the roof line!